Membership in the Jersey Blue Chapter NSDAR offers a variety of programs, service opportunities and social events throughout the year. We have a rich history of accomplishment in the DAR’s mission of historical preservation, education and patriotic public service – all while forging strong friendships with one another and making Jersey Blue a group in which we all love to belong. There are many ways to get involved so you can find whatever activities best suit your interests and abilities. Prospective members are welcome at events, programs and meetings, so join us to see what Jersey Blue is all about! Celebrating the birthday of Dr. Seuss, Jersey Blue members dressed the part and joined Adamsville School librarian, Kelly Mummer, in reading to students from a selection of books donated by the chapter. On the 241st anniversary of the third reading of the Declaration of Independence by Colonel John Neilson, Jersey Blue members, Colonel John Neilson Society, C.A.R. members and direct descendants of Colonel Neilson attended the statue dedication and unveiling depicting that moment in history. With several direct descendants of Colonel Neilson as members, Jersey Blue and Colonel John Neilson Society each contributed sponsorships to build the statue's base. Jersey Blue and Colonel John Neilson members practiced their colonial curtsies at the fun-filled historical celebrations of Middlesex County's History Day at the East Jersey Olde Town Village. Regent Mimi Chu presented a Youth Citizenship Award certificate and pin to Civil Air Patrol Cadet Colonel Matthew Jackson at the New Jersey Wing Conference where Jackson was honored as Cadet of the Year. Each Thursday, Jersey Blues run a clothing distribution room at the Menlo Park Veterans' Home. The clothing is all new and donated by various groups for the use and comfort of the veteran residents. Enthusiastic Jersey Blue volunteers sorted and packed items into holiday gift bags for residents during the holiday season. Jersey Blues and guests visited the Cornelius Low House in Piscataway, New Jersey where several items from Buccleuch Mansion are on loan for display. Afterwards, members gathered for a Holiday Social get-together for good food, good friends and good times! Jersey Blues represented America at the 2nd Annual Multicultural Night at Adamsville School in Bridgewater, New Jersey with over 350 school staff, parents and students as they learned about the many countries and cultures represented in the school. Jersey Blues hosted Spring Fling Mini Golf at the Menlo Park Veterans' Home. Volunteers clapped and cheered for the players! Barbara Michaels, professional appraiser and button collector, shared memories from her prized collection and how she began collecting buttons. Celebrating 100 years since Jersey Blue was entrusted with the care of Buccleuch Mansion, the chapter exhibited a display of carefully preserved wedding dresses showcasing the many bridal styles of the past century. Frances Mahoney from AT&T taught Jersey Blues invaluable safety and security lessons during a presentation on how to deter, detect and defend against identify theft. Jersey Blues and guests gathered at the Cornelius Low House for an engaging World War I exhibit, followed by a holiday house tour and selection of sweet treats at Buccleuch Mansion. Jersey Blues and guests unleashed their inner artists and painted their own unique masterpieces while sharing in some good food, wine and fun at the annual holiday social. Jersey Blue volunteers sorted, packed and supervised the relocation of hundreds of items from Buccleuch Mansion’s collections for the building’s massive restoration effort beginning in summer 2017. 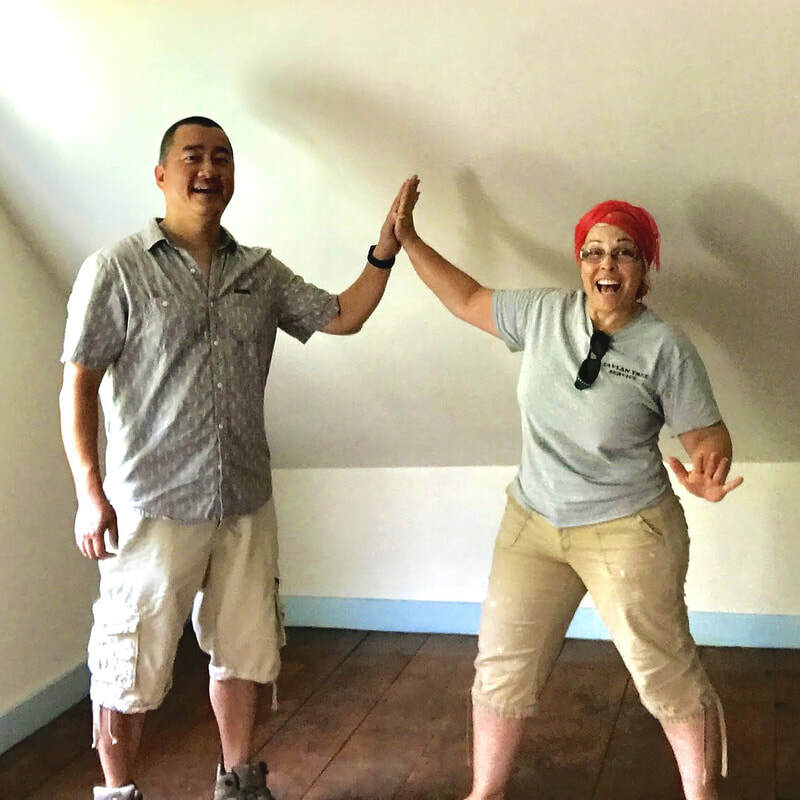 Here, Regent Mimi Chu and her husband high five after a tireless, but successful, afternoon cleaning and preparing every room for the structural work to start. After a ‘Dutch Treat’ luncheon, Jersey Blues toured Watson House, Mercer County’s oldest home built in 1708, with colonial-costumed volunteers as guides. Today, Watson House serves as the state headquarters of the NJDAR and displays several historic pieces donated by New Jersey Daughters. In honor of the birthday of Dr. Seuss, Jersey Blues donned Cat in the Hat hats and read to students at the Adamsville School in Bridgewater, New Jersey during Read Across American Day. ​Jersey Blues were joined by Colonel John Neilson Chapter, C.A.R. before Memorial Day 2016 to distribute flags throughout Middlesex, Somerset, Union and Morris Counties on American Revolutionary and Civil War veterans' graves. Director and past Regent Susan Luczu presented a tableful of fall treats and recipes for Jersey Blues to learn about, but it was eating the treats that members liked best! Jersey Blues joined hundreds of other members across the state at the Washington Memorial Chapel at Valley Forge National Park for a service to honor the soldiers who suffered through the terrible winter camped at Valley Forge during the American Revolution. Jersey Blues attended the Menlo Park Veteran's Home Volunteer Recognition Luncheon representing the chapter and the various veterans activities members participate in at the home. Jersey Blues took part in a basket weaving demonstration from past Regent Marjorie Freeman and learned about the vital roles these simple vessels have played in American history. Jersey Blues took part and celebrated with excited new citizens as they took the oath of allegiance during the naturalization ceremony in October. Jersey Blues were joined by Miss New Jersey Teen USA 2014 at the annual Holiday Mini Golf for residents of the Menlo Park Veterans' Home. The Jersey Blue Chapter was joined by the Colonel John Neilson Society, Children of the American Revolution (C.A.R.) before Memorial Day 2017 to honor veterans by placing flags on patriots' graves throughout several central New Jersey counties. Dana Balsamo, Certified Quilt Appraiser, displayed a beautiful array of antique quilts at a program held at the Middlesex County Library. Jersey Blues discussed ​quilt-making techniques, asked questions and felt the historic fabrics of these treasured family heirlooms! Jersey Blues held their very own Kentucky Derby celebration and learned about the history of the famous race, as well as some interesting trivia about the state of Kentucky. Members even got to know the actual names of the horses entered! ​one-on-one playing time during the annual Crazy Hat Golf event hosted by Jersey Blue at the Menlo Park Veterans' Home. Every player gets a prize, but it is always the hats that make it the most fun! Jersey Blues manned the table at East Jersey Old Town’s History Day in Piscataway, New Jersey to discuss DAR with visitors interested in joining the chapter. Jersey Blues crocheted and knitted baby hats to spread awareness of infant abuse through The Purple Caps Program. Jersey Blue hosted the annual event at the Menlo Park Veterans' Home where residents enjoyed a concert of patriotic music by an especially talented chapter member before the awards ceremony began. Even if chapter members can’t make it out to every event, Jersey Blues still show appreciation for vet’s service by making handmade greeting cards for residents at the Menlo Park Veterans' home. Jersey Blues organize a themed mini golf event each month for residents of the Menlo Park Veterans' Home. Martha Washington was there cheering on the golfers! Jersey Blues sampled award-winning teas and glasses of champagne along with a fine selection of tea breads, scones with Devonshire cream, homemade jams and finger sandwiches during an afternoon tea social. Jersey Blue volunteers handed out water to the walkers at the 2013 Foster and Adoptive Family Services (FAFS) Walk in South Brunswick, New Jersey.